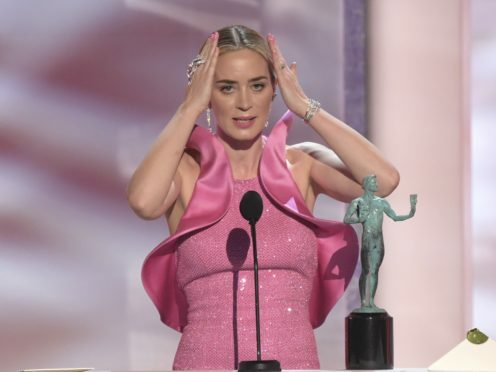 Emily Blunt paid tribute to her director husband John Krasinski and their “two little poems” as she was a surprise winner at the Screen Actors Guild Awards. The British star beat out The Favourite’s Rachel Weisz and Emma Stone, Amy Adams for Vice and Margot Robbie for Mary Queen Of Scots to take the best supporting actress prize for her role in The Quiet Place. Visibly shocked as her name was called, she embraced her husband, who was her director and co-star in the thriller, before making her way to the stage, hugging Weisz and Stone on her way up. She said: “Oh my goodness me. Guys, that truly has completely blown my slicked hair back. Mahershala Ali took home the gong for outstanding performance by a male actor in a supporting role for his part in Green Book. Thanking the other actors nominated in the category, he said: “The more I am fortunate and blessed to get to do this work, the more I realise how much I need all of you in this room to draw inspiration… and get my cues how to go deeper… I am grateful to be amongst this fraternity of people, this fraternity of artists…”. Amazon Prime series The Marvellous Mrs Maisel has dominated the television categories, taking the award for best ensemble in a comedy series, as well as outstanding performance by a female actor in a comedy series for Rachel Brosnahan and male actor in a comedy series for Tony Shalhoub.